OK, well as the title cleverly spells backwards, Our Home is a Aussie tale that many of us will be able to relate to. This movie tells the story of the typical battling family and their cherished possession: Their home. This is an older title and it does show through throughout with different aspects of the movie glaringly lacking due to the first time efforts of the script writers, and a director whose work was largely based in television. One of the first things you will notice or draw similarities to is The Castle, the highly popular Aussie comedy about roughly the same thing, the fight to keep their home. Whilst this was filmed in about 1985 and precedes The Castle, the latter is a highly polished and delightful trip into Australiana. There are some genuinely funny moments to this flick, however most of it comes across as a tad ockerish to me and forced. Aficionados of the era might like the beer and bbq references or feeling to the movie but simply put, for the most part I was left pretty cold. 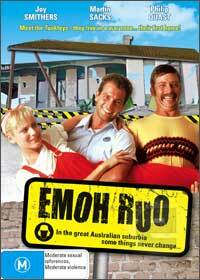 That said, if you simply must watch Aussie film, then I guess this is one. Making "Weekend of Summer Last"